Twenty years ago I completed my Master’s work in the Chaco forests of northern Argentina. The native forests are, in fact, rangelands. In addition to livestock production, the forests are used for timber extraction and wildlife harvest (think tegu lizard cowboy boots). I took part in a project comparing biodiversity among production systems. A new system promised to reverse biodiversity loss and soil degradation. But it’s a moot point now since many of those forests have been cleared for cropland--the highest rate of tropical forest loss in the world. The Gran Chaco is a vast sedimentary plain of over 500,000 square miles in the center of South America. It is the largest continuous dry forest area on the continent. The historical vegetation of the Chaco was a parkland of grassy areas maintained by fires, interspersed with patches of hardwood trees. After European settlement, uncontrolled grazing and loss of indigenous fire use led to a thickening of woody plants. The western Chaco is so thick that it is referred to as el impenetrable. In areas of heaviest use near to water wells of the puestos, or ranch dwellings, even the woody plants can’t keep up with goat grazing and fuelwood harvest, resulting in open woodland with compacted bare soil between the trees. These changes are believed to have diminished biodiversity and increased poverty among indigenous peoples and “Chaco campesinos”, a group of mixed European and indigenous ancestry. The project I worked on tested the effects of a new type of production system on biodiversity. This system used pasture fencing combined with grazing rest and managed stocking rates in an effort to produce beef and timber products sustainably. The Salta management system (named after the province in Argentina where we worked) was compared to the traditional puesto management system in which goat and cattle grazing is centered on a water point. Puesto grazing produces a “piosphere” pattern of increasing vegetation cover with distance from the water source. I worked on ant communities (a common animal bioindicator), others worked on reptiles. Later studies examined birds across multiple puestos. The results of these studies have been remarkably consistent across animal groups, and surprising. Areas near to puestos—the so-called degraded areas—harbor substantial biodiversity. The habitats produced by heavy grazing within a few hundred meters of the puesto favored species adapted to open areas. These are not necessarily weedy species. Some may have been associated with the former open grassland patches (suggesting that it is not the grass that matters to some animal species, but the lack of trees). In addition, well-based water sources may be important for birds. Areas farther from puestos, however, harbored rare species associated with more complex vegetation and higher cover. The combination of open and structurally complex vegetation, including that produced by the Salta management system, supported exceptional biodiversity at the landscape level. Those landscapes are now disappearing. An amazing new product, the Global Forest Change dataset, was released last year with an analysis published in Science. The dataset documents change in forest cover globally from 2000-2012. It can be viewed online and the data can be downloaded. Within 50 km of my study site in Salta province, 27 % of the forested area in 2000 was converted to cropland or introduced pasture by 2012. You can see the pattern of deforestation at an even broader extent here. According to the University of Maryland group, this is the fastest rate of tropical deforestation occurring anywhere in the world. And the puestos are disappearing with the forest. I haven’t been back to Salta, so I have no first-hand knowledge of the effects of development on the remaining forest and on people that I came to know. It has been proposed that deforestation may benefit biodiversity because puesto abandonment leads to vegetation recovery in the remaining forests. It is possible that poverty is being alleviated locally as campesinos move to cities and regionally due to the exports of agricultural goods abroad—mostly soybeans to China for animal feed. It is also reported that the campesinos are being pushed off their land, and even murdered, to make way for corporate soybean farms. And with the campesinos, the biodiversity to which they contributed (and were a part) is disappearing. The Salta vs puesto management system debate, along with my Master’s thesis, is now an anachronism. The place I studied was at the cusp of a new stage in the Earth’s transformation, we could call it ‘the middle Anthropocene’, in which corporate agriculture replaces small-scale ranching. I hoped to produce science that promoted sustainability within the puesto landscape, but the puestos-as-degradation narrative that motivated my research simply greased the skids of land conversion. I wonder if I would have framed my thesis differently if I had any inkling of what was coming. Would I have celebrated the diversity of the puesto landscape to a greater degree? As a scientist, I have learned to be as skeptical of the narratives behind the hypotheses as I am of the hypotheses themselves. Maybe the 2008 Native Forest Law in Salta will yield an adequate balance between pastoral and cropland land uses. Time will tell, but the pressure to convert the remaining forest will only increase. I’ve thought about going back to Salta to see what is happening firsthand, but there is no going back to the Chaco I once knew. Permalink Submitted by psundt on Mon, 05/26/2014 - 11:35. Thanks for your interesting blog on the Chaco. I was asked in the early 1990s to develop a rangeland management system for a demonstration goat ranch, in a region of poor, ejido, goat herders in San Luis Potosi, Mexico. The idea was to demonstrate to locals the benefits of rotational grazing, rest, and improved genetics. 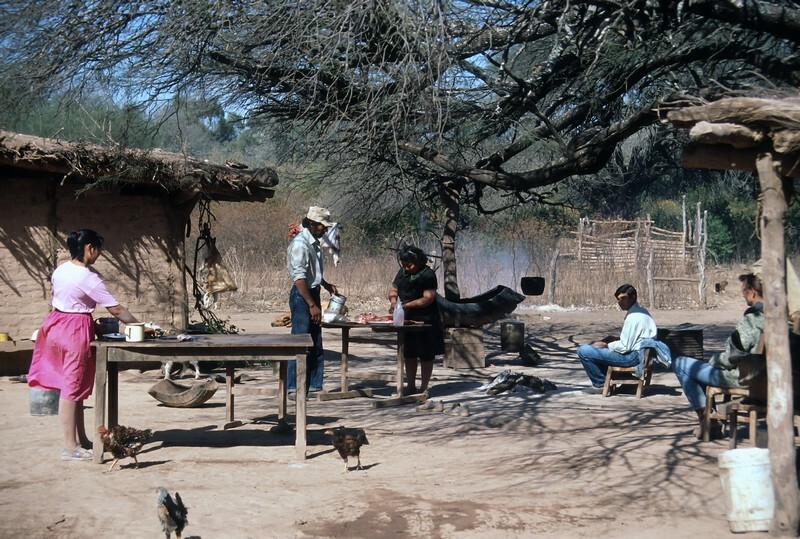 After a couple of summer seasons it became clear that the obstacles were not ecological knowledge or improved techniques, but rather poverty, communal ownership without communal management, and exploitation by wholesale goat dealers--problems for Mexican social workers, not NorteAmericano ecologists. Only the shallow limestone soil and low rainfall prevent the region's conversion to GMO corn or soy. What should land ecologists be able to do? Permalink Submitted by Brandon Bestelmeyer on Tue, 05/27/2014 - 10:03. Thanks for reply Pete. I think the issue you point out is a general one. The question is, if it weren't for folks like you to provide that analysis, then who would be able to identify key problems in the first place? I think this speaks to the training and toolbox needed by ecologists (what I would call land ecologists in particular). Maybe being community organizers is a task too far for most of us, but being able to see past plant and animal populations or soil carbon to the functioning of human institutions should be part of our skillsets and analyses. That information can be delivered to policymakers or those promoting social change and, as your case suggests, can be the most important information for improving land conditions and human livelihoods. I'll venture to say that most of the thresholds in drylands are actually social rather than biophysical. I am a newbie at this but fortunately others are being trained (for example, the previous translational ecology post). Ill also point to this paper http://rstb.royalsocietypublishing.org/content/367/1606/3158.short that provides a "social-ecological systems" analysis of a community in San Luis Potosi. I can send the .pdf to you if you like. This type of analysis is the next step for us. Permalink Submitted by andrewleake on Tue, 10/27/2015 - 14:54. I live and work in Salta, focussing on deforestation and land use in the Chaco region. I was most interested in what you mention in this blog re biodiversity in and around the puestos. I had not heard of this argument but it does make sense. Is this part of broader research, is it published, can I acces a copy? Permalink Submitted by Brandon Bestelmeyer on Tue, 10/27/2015 - 18:29. Those statements are based on citations in the hyperlinks and those can be found in this paper in Rangelands based on the blog post. I hope your work is going well in Salta, and would love hear more about it.